The founding statements of several major museums include a commitment to education. Are museum public programmes an extension of the discipline of art history, or can they have a more radical purpose? On any given weekday and at any given museum, you will see or, more likely hear, groups of schoolchildren being led through the museum by one of its freelance educators. Sat cross-legged in rows in front of a painting, sculpture, photograph, or installation, children are being taught in what sounds like a rather simplistic way. The teaching consists of a sequence of questions (What do you see? What makes you say that? ), the answers to which lead to the next question, and the next, until some sort of revelation about the work of art has taken place; a revelation guided by the educator but apparently stumbled upon by the children themselves. Replace those schoolchildren with a group of blind and visually impaired people, or the deaf, or older audiences suffering from dementia, or any kind of audience, and you will have a sense of the scope of museum education programmes. And if you picture an equally wide variety of approaches to learning – from storytelling with musical accompaniment, to drawing, sculpting, performance, creative writing, filmmaking, dance, and on and on – then it’s clear that there are as many ways to engage with works of art as there are audiences to see it. As a museum educator for the National Gallery and Dulwich Picture Gallery, and, before that, the Museum of Modern Art and Solomon R. Guggenheim Museum, New York, I’ve witnessed many examples of art-historical learning. The open-ended questioning used in the teaching method I’ve just described is the opposite of the transmission of information familiar from, for example, televised art history. The artist’s name, the date of the work, and even its title – the stuff of labels and audio guides – are often given only at the very end; these are largely irrelevant pieces of data in the sequence of questioning. What’s emphasised, by contrast, are the moments where a bridge is built between the object and the viewer. Let’s consider, then, what is actually happening in this scenario. A group, many of whom may be first-time visitors to this or any museum, many of whom may not realise that they have the ability to think seriously about works of art from far away and long ago, have attained a kind of closeness to an important work of art. The process sounds a great deal like art history. American institutions have largely set the tone for modern museum education. The Barnes Foundation, which opened in Merion, Philadelphia in 1925, was established first and foremost as an educational institution, under the influence of Albert C. Barnes’s mentor and the Foundation’s first director of education, John Dewey. Dewey’s progressive educational philosophy has underpinned the practice of museum education to this day. ‘Experiential learning’ – or ‘learning by doing’ – is one of his key tenets and its legacy can be seen everywhere. The Barnes is a rare case of a world-class art institution founded to educate a wider public; Barnes underscored this intention by building the gallery in suburban Merion rather than downtown Philadelphia. However, the founding charters of many museums established in the late 19th century refer to the institution as a bastion of learning. The Metropolitan Museum of Art’s 1870 mission statement includes its intention of ‘advancing the knowledge of kindred subjects, and, to that end, of furnishing popular instruction’. When the Louvre opened as the Musée Central des Arts in 1793, for seven days of the revolutionary 10-day week it was open only to artists, for their education and inspiration; the rest of the public could attend during the three-day weekend. Despite these efforts, the history of museum education per se is a comparatively short one. The programmes I’ve already described were little in evidence even by the middle of the last century, when learning was still largely understood as an extension of traditional curatorial practice: imagine worms dropped into chicks’ open beaks.Yet as museums have transformed themselves according to the demands of new audiences, the nature of education within museums has also changed. Recent educational practice in museums has placed the greatest emphasis on reflection: time to contemplate, share thoughts, and create one’s own artistic responses to works of art. 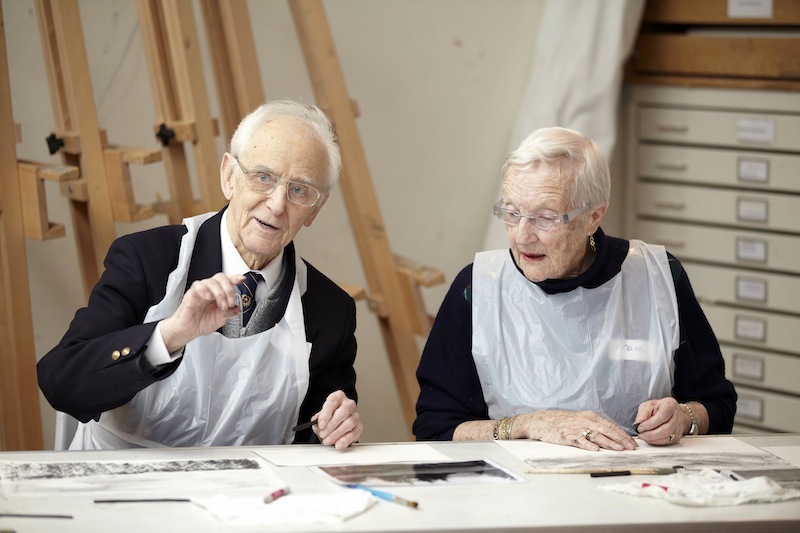 At Dulwich Picture Gallery, for example, programmes such as ‘Good Times: Art for Older People’ combine close and careful discussion of a small number of works of art on the walls of the gallery with practical art workshops led by an artist. That a number of these participants suffer from dementia (they are accompanied by a friend, family member or carer), or live alone, only emphasises the importance of such programmes in making a communal space for discovery, discussion and creativity. And by using the collection or a temporary exhibition as the catalyst for learning, such programmes have a curious relationship with the institution. A good education programme is a critical mirror of the museum itself. Small wonder, then, that museum education has influenced many contemporary artists looking to question the authority of the museum, under the banner of relational aesthetics. In her 1989 Museum Highlights performance, Andrea Fraser stars as a tour guide enthusing over the museum’s toilets for bemused visitors. In his 2010 Guggenheim exhibition in New York, Tino Sehgal employed guides who engaged members of the public in open-ended philosophical discussion. Both artists exploited the public’s tendency to trust the museum’s staff. But this kind of examination goes on, less theatrically, in museum education programming every day. The post-Duchampian moment of art history, in which the spectator actively participates in the creation of meaning, has been quietly happening all along. There is a sense in which museum education is artistic practice. Criticisms of museum education – setting aside the views of those reluctant to allow sound-making humans into art galleries at all – often take the form of a Lutheran invective. There’s too much interference, they argue, between the viewer and the object, and audiences would do better engaging with works of art on their own terms, without all the chatter. To this, the museum education establishment takes a Counter-Reformation position: Do it more! Do it louder! And yet the critics have a point. At its least effective, education in museums leans towards transmission: too much interpretative language, delivered in the condescending warble of the grown ups in Peanuts, obscures the object. At the other extreme, a self-consciously radical form of educational practice will fail if it relies entirely on eliciting answers to open questions about an artwork; the withholding of useful information, such as historical setting, technical description, or simply the artist’s country of origin, creates an unnecessary barrier to understanding that education programmes were set up to knock down. An hour with a museum educator can be a door opening on to a new landscape, or the repeated bashing of a head against a wall. We need a broader interpretation of education. A huge variety of approaches, arguably led by American museums, already exists. These include curatorial initiatives for teenagers (such as that at the Albright-Knox, Buffalo, New York); iPad drawing, design and photography workshops (Victoria and Albert Museum); 3D-printed models of paintings for use by the blind and visually impaired (the Prado, which has just curated its first exhibition aimed specifically at these visitors); hands-on activities, writing workshops, musical performances – even sleepovers (The Natural History Museum and the British Museum). Every one of these is, in its own way, a facet of the prism through which we see the past. In a recent programme at the National Gallery called ‘Looking without Talking’, participants were each given a room to themselves in the Dutch galleries, wherein a single painting had been lit and the rest of the room was in shadow. As they looked at the work alone, these individuals experienced what the rest of us rarely do: complete absorption in a single object. In contrast with many of our experiences of art galleries and museums, where over-stimulation is the norm, an old kind of looking gradually returned. In a darkened room in central London, time stopped and the paintings spoke. A prescriptive approach to learning, especially in a space as variably used and understood as a museum, is pointless. In art museums in particular, the patrician emphasis on a body of knowledge accessed only by a few seems inappropriate; it rests on the misunderstanding that academic art history is the sole translator of the meaning of works of art. Of course the intellectual history and legacy of research embodied in the museum should not be treated with disdain; but the treasures of the past can only be appreciated as treasures if the methods by which they are discussed keep up with contemporary consciousness. Museums ought to recognise that museum education is simply the latest way of saying what we’ve all been saying, all along: the act of looking and thinking is a way of continuing the trajectory of a work of art; or as Bob Dylan recently described his mining of the traditions of American music, ‘extending the line’. At the Nottingham Castle Museum and Art Gallery there is a separate section showing items likely to be of interest to children, with text to prompt their enquiry. This is a good way to capture the interest of children, leaving exploration of the rest of the Castle for a later visit by those who want to go further. It reduces the spread of school children through the museum, to the discomfort of those in a contemplative mood.